While obvious, the headline also engages in a bit of overstatement. 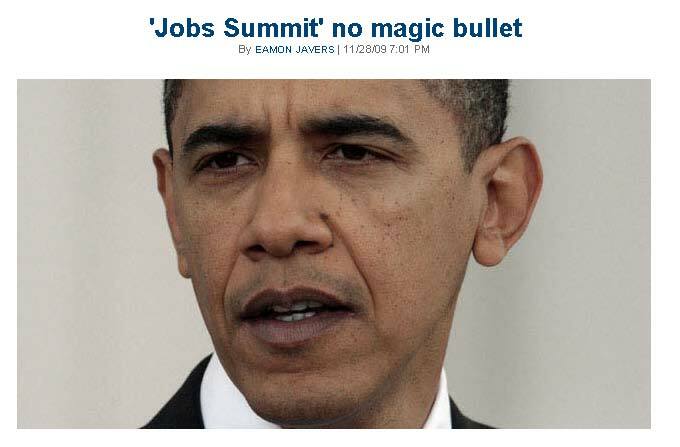 The "jobs summit" not only is not a magic bullet, it also is not even a bullet. It is the equivalent of an upper-level seminar on job creation offered by a professor who never created a job. Liberal Economics: Money falls from heaven for everyone to use. But, the immoral and sneaky rich gather more than their share. The government's purpose is to redistribute the money the way God intended. Or, if you wish, the way Gaia, or the Tooth Fairy, or whoever intended. Taxes remove the excess income of the rich and give it to the voting poor, through a fair and organized bureaucracy. The rich oppose this action by selfishly and spitefully decreasing employment. Government responds by increasing grants and spending, to boost employment. The government runs a deficit while it discovers the "knack" for creating the jobs that the rich are hiding. So, a jobs summit makes perfect sense. Call a meeting and send out the operatives to find where the jobs are stashed. Make those business owners reveal where they are unfairly hiding them. He can't even host a successful beer summit never mind one on job creation. Want to create jobs? Stop taxing and spending. Whenever he opens his mouth, there is no room for his shoe - it's already full of, "let me be clear" his agenda for taxing and spending. He speaks ex-cathedra never as a proponent of "possible" legislation. How do you stop taxing and spending? You just put your lips together and shut up. Who would like to see Obama legally ousted before 2012? Yes, it can be done, and these graphics illustrate the process. If you know anyone who qualifies as an “interested” or “third” person as described in the graphics, please share this information. We all know Obama has never met a payroll, managed a business or led men in battle, but neither has 90% of his cabinet. JPMorgan prepared this chart to show how little real world experience the dopes running the executive branch have relative to other administrations since 1900. Wait a second. Politico puts a headline up with Obama's picture and the word bullet in the headline. Isn't that a coded message for assassination of the President. I'm sure if it were a republican website that did so, Keith Overbite, Chrissy Matthews and Rachel Madcow would be all over the evil rightwing conspiracy against St. Obama.